This is really mean. 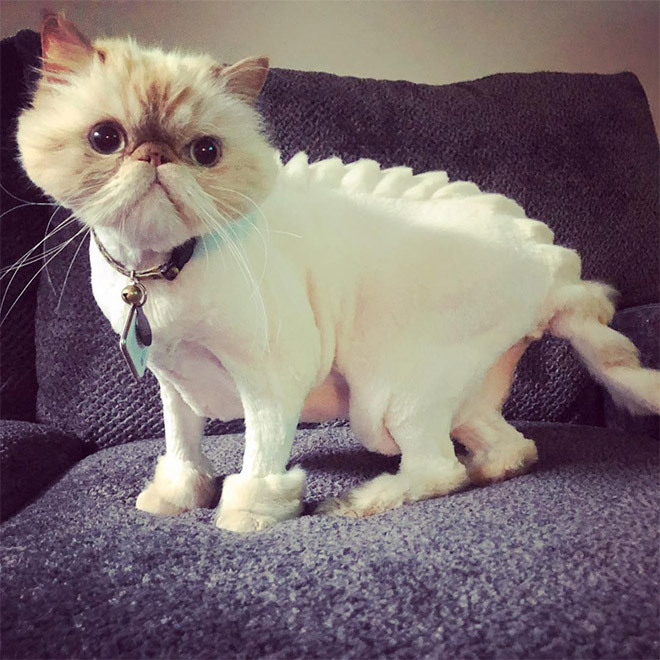 Who thought this was a good idea or cute. 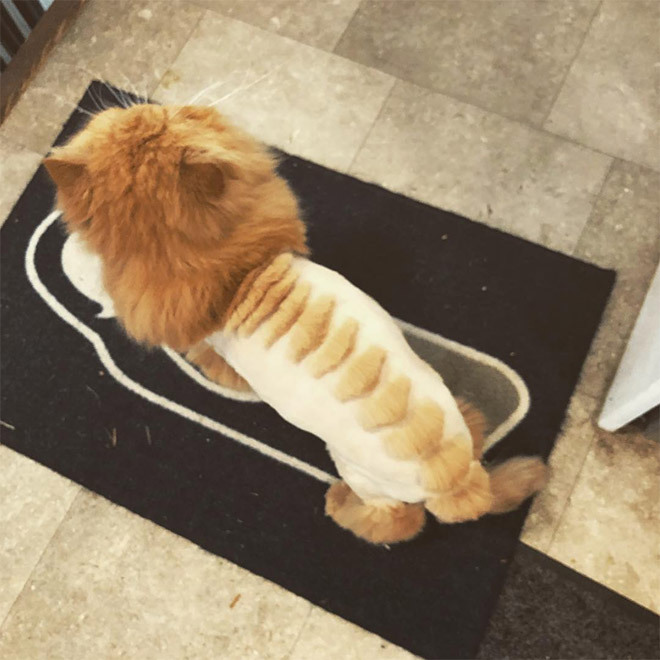 So your saying the more fur a cat has the cooler it will be? Ha Ha Ha!!!! P.S The body whisker thing is pretty funny to. If it is an indoor cat (as it should be for many reasons, but that’s another issue for another article), then the concern for warm or cold isn’t really relevant, and I see no issue with it. It is fur, and if they are indoors, good owners will ensure the temperature of the environment is appropriate. THE COLORING/DYE/PRODUCT IS ANOTHER MATTER! 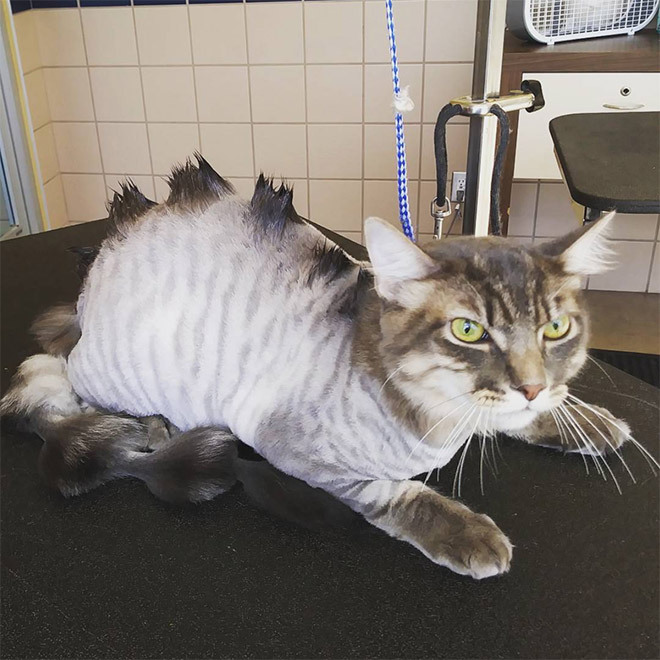 That is very dangerous, and even if it is labeled as “safe”, you KNOW that cats groom themselves a lot, and no, it isn’t going to be 100% safe as they WILL ingest that dye, and their systems are actually quite sensitive to things like that. BAD move on the product/dye additions. 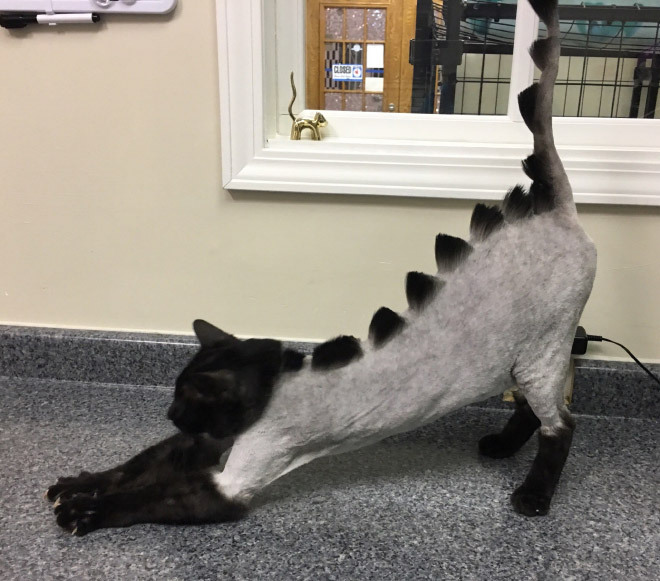 The furcut is just a furcut, and isn’t going to harm them. 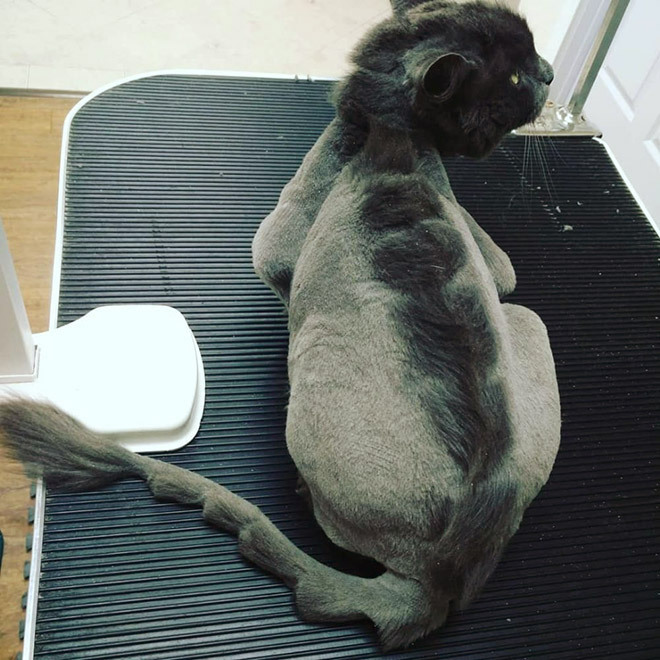 As a pet groomer i know that some breeds of cats are almost required to be shaved to ensure a comfortable life without matting AND overheating. 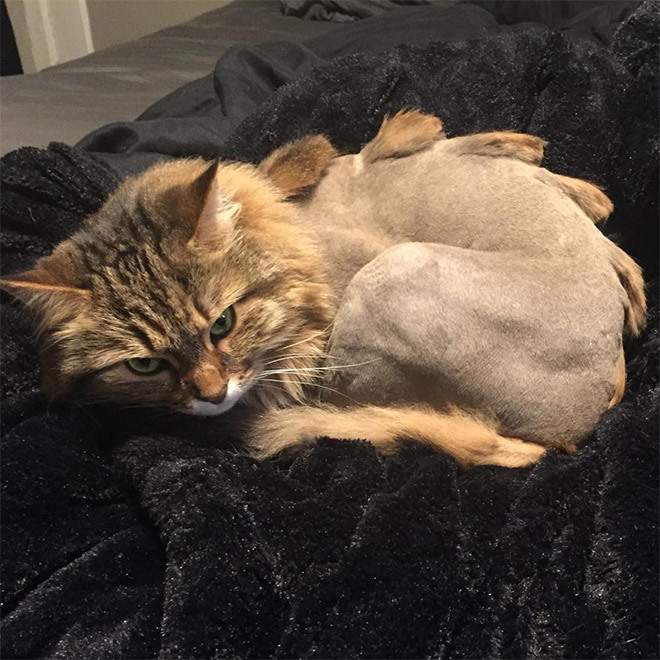 Shaving a short haired cat (which these aren’t) can cause hair regrowth issues but for most long haired breeds are much happier and energetic without all the hot tangled hair on thier body. 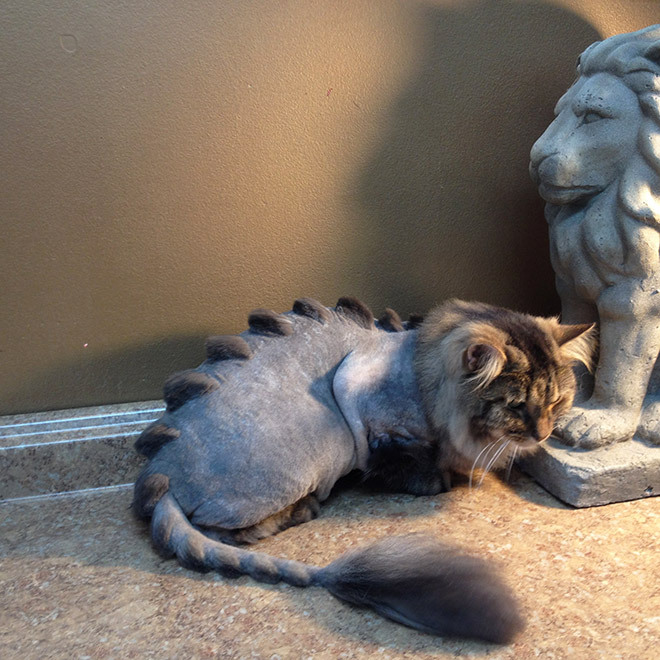 Not to mention animals with outlandish haircuts almost ALWAYS get more attention which makes them happier as well. Win win. As others said, i’m not an advocate of dies either. Most do not look happy. Did they willingly sit still while a clipper was used? The one with the green on it’s face look especially unhappy. Send that money to starving children somewhere. Some are pretty damn cute! If the cats up to it I say go for! No dyes! Ridiculous! Cats are gorgeous creatures …. this is sabbotaging their natural beauty by making them look like stuffed animals. THIS IS SAD. Should be illegal. Show some respect to your pets please. What!! 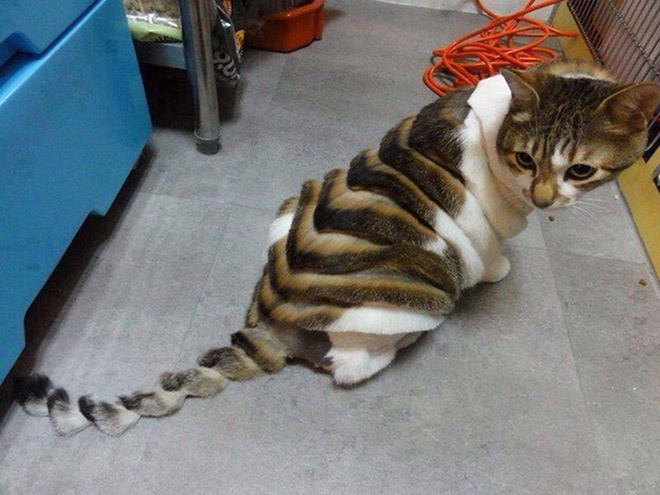 Why would you hurt the cat!!!!!!! That’s really could hurt don’t ever do that again!!! None of these cats look happy or content. Don’t do it. This is absolutely horrible. Please find another way to use your time-start trying to figure out how to solve homelessness-offer free shaves for those in need. 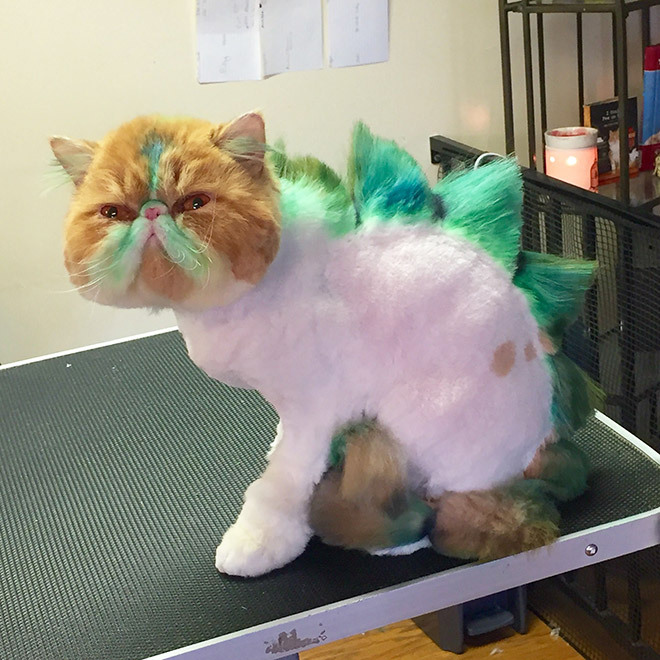 Good grief-go buy a stuffed animal if you want it to look like this. Another example of humanity meddling where they don’t belong. 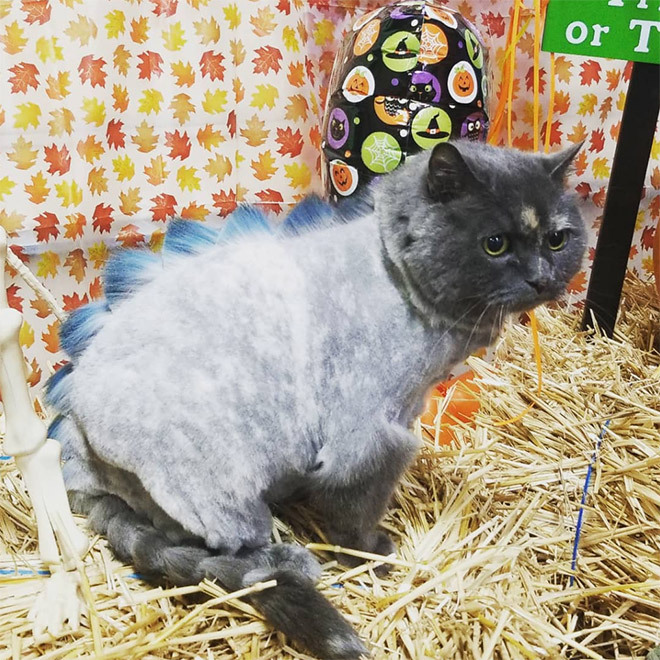 You just took an already beautiful creature that looks good just the way it is and turned it into something ridiculous and goofy-looking. The stupidity of humanity never ceases to surprise me. Though I will say, being that it’s on a website called “sadanduseless.com,” it definitely fits. Because those “haircuts” are exactly that. I think it’s creative just like anyone else who creates a design on their own head. No hair on my head keeps me warm or cold depending on the season. 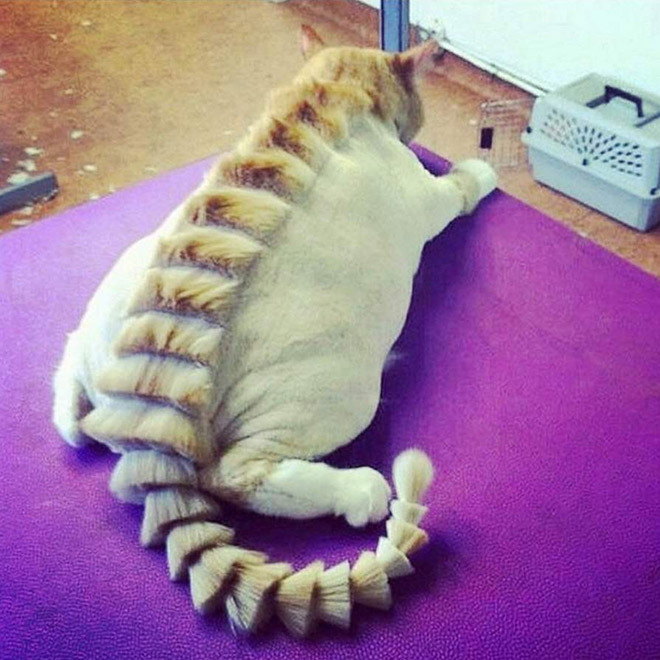 These cat owners must really love their animals and lots of attention to even want to do this. I find it unattractive but not offensive. You all know theses are house cats!!! You can tell they are pampered. I agree the dye could be toxic unless it’s some vegetable dye, let’s hope. BTW I have a Maltese and I love giving her pretty haircuts. We have fun bonding during the cuts! 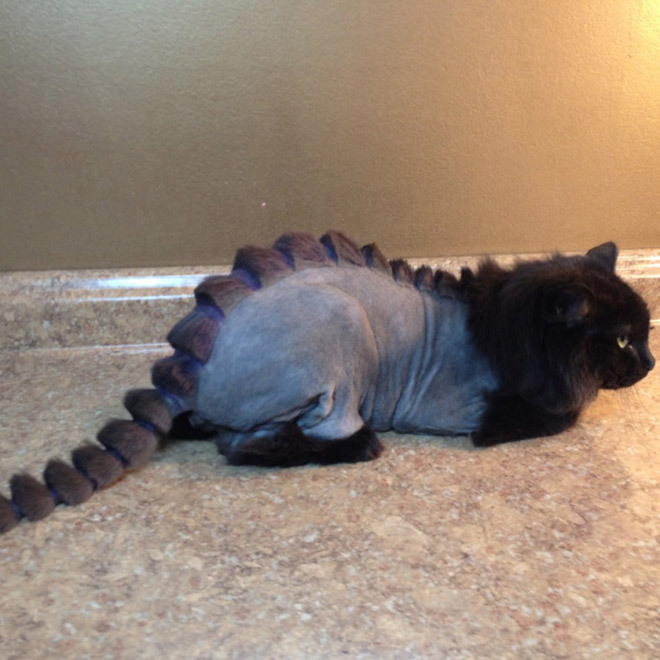 Whoever does this to her cat deserves to be whipped. 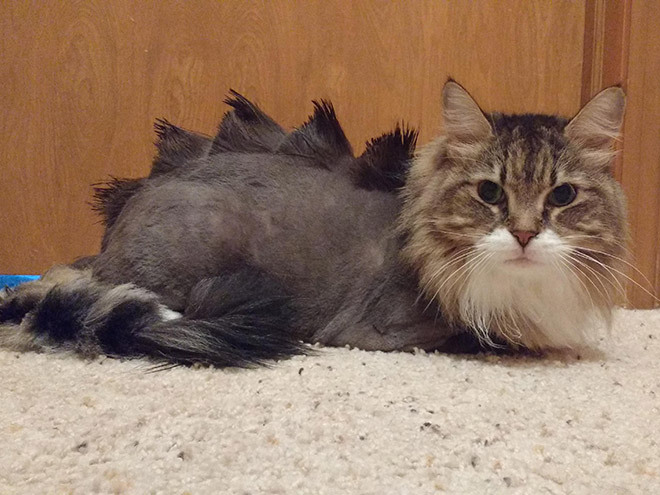 And we wonder why cats hate us. 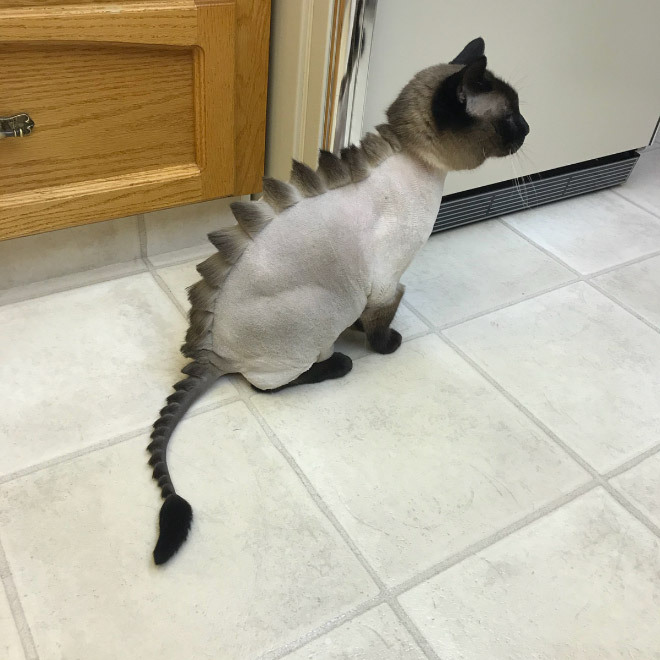 Cats were not made by God with so-called ‘dino’ haircuts!!!!!!!!!! Not funny at all. 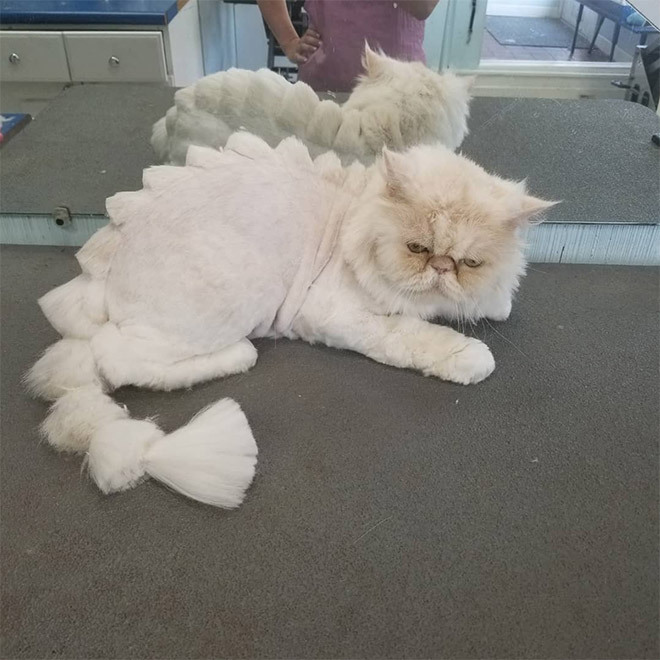 The cats should be taken away from their owners and the groomers should be fired. Who even came up wit this? 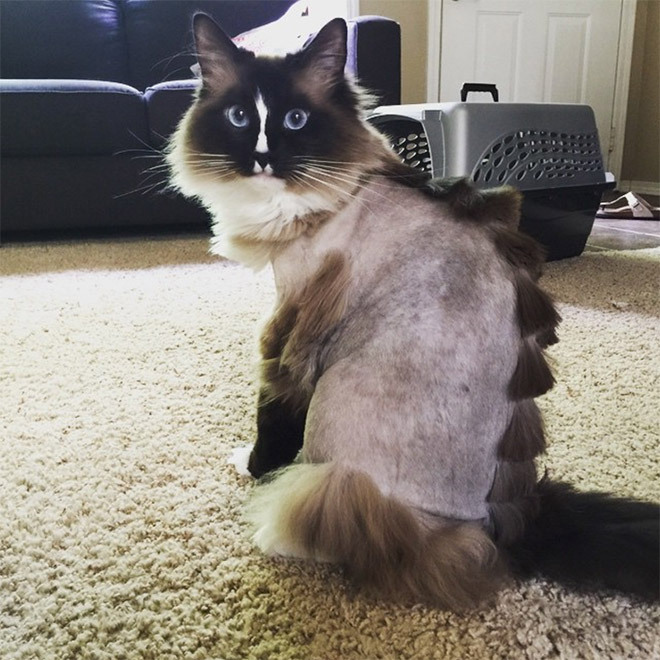 Wrong– when cats get shaved, their whiskers are NOT trimmed… my cat gets trimmed every year. Shes good w it. Actually is cooler for her. Whiskers are long and luscious as ever. My vet is kind and gentle… no trauma. 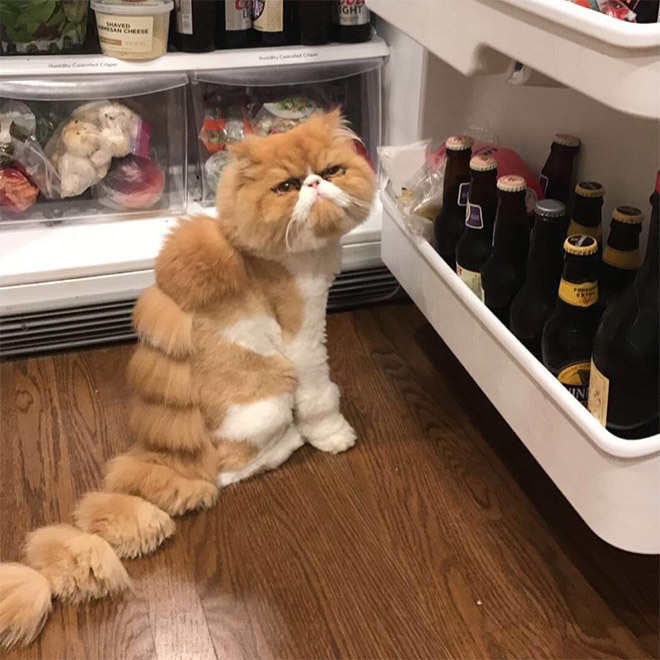 I think the owners should be shaved. 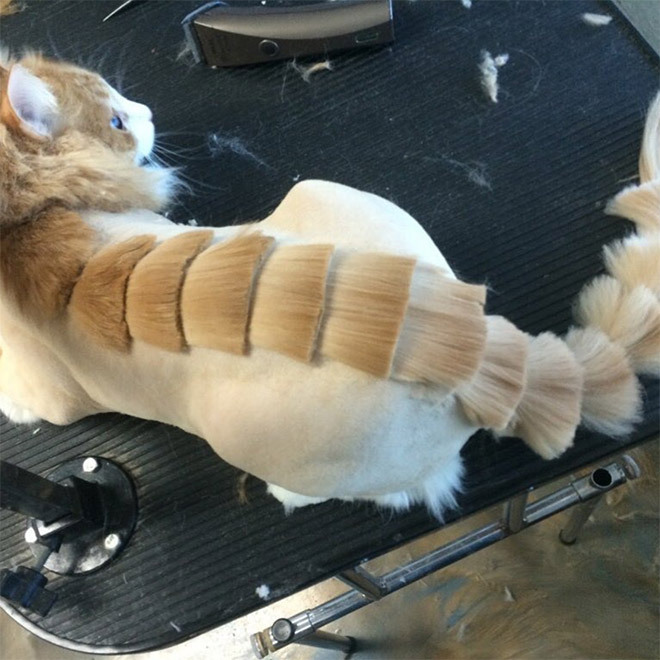 This is terrible you should never do this to your kitty!!! 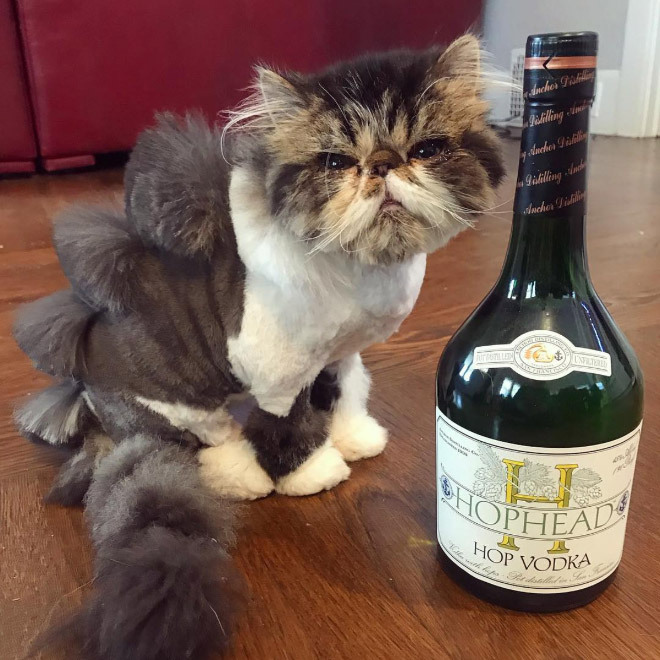 Every single cat looks miserable. Cruel practice done by people with zero empathy for their pets. If you need attention this badly get a hot pink mohawk yourself – or do you think that will make you look stupid…duh. 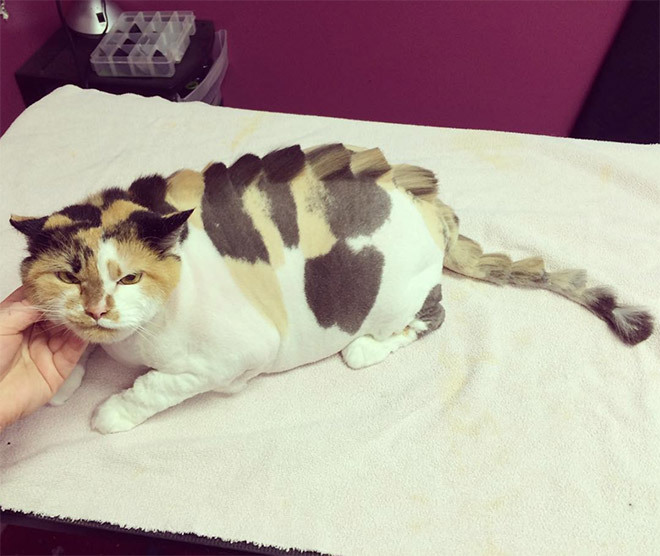 Most groomers are very gentle, I have a long haired cat named Missie and she enjoys getting trims in the summer, but I do get the dyes they shouldnt put dyes in their fur!